March 18, 2018 Amy P.
I just finished Alain de Botton's The Course of Love. I read this book over the course of a few weeks, sometimes reading for hours on end and then letting a few days pass before I picked it back up. I think this was a wise way to read this book, as it needs to be absorbed rather than consumed. The book is a novel, yet it has bits of philosophy woven throughout, which I first thought might be annoying. Rather, I found these passages to be the most meaningful for me, and I'm grateful de Botton included them within the story. Speaking of story, there definitely is one, but it isn't a story held captive by the usual writing rules and plot devices. It's more of the kind of story you'd hear from a friend you've known for decades, one who finally tells you all his secrets and the truths of his life, including the private details of his marriage. Of all the adjectives I might use to describe this book, provocative might be the most applicable. I don't mean provocative in the sense that it's risqué or titillating. I mean provocative more in the sense of thought provoking and mentally/emotionally stimulating. Really, do I know what I mean? 1. I think this book should be required reading before one enters into a marriage or any other long-term, committed relationship. It won't make any difference in the moment, I don't think. We all believe our relationships are different, better or superior to any others, but if a person has this the back of her head, when the time is right, the words will resonate. 2. I also think this book should be required reading before a person sets in motion a divorce. I am not divorced, so I say that with hesitation and humility. Still, I think many unhappily married people might gain quite a lot from this book, the story and the philosophical perspective. 4. I would never in a million years live in Scotland and endure that sort of weather. One wonders if that might have made all the difference (I'm only half-kidding). 5. The writing is exceptional and decidedly un-American. I like de Botton's style; though I can't say it would do a whole lot for me if this was strictly a novel. 6. My favorite passage from the book is, "....there is no one more likely to destroy us than the person we marry" (de Botton, 36). I should note that I understand the word 'destroy' to be multifaceted here and not merely to obliterate someone financially or emotionally. Destruction of one thing can often be the opening of another. 7. Much of this book deals not only with romantic love but with parenting and the sort of love we have to not only foster but cull as parents. There is also a lot of discussion about the children within our own selves, the ones who may not have been properly taken care of while young and who still live very much inside of us. One of my favorite passages is when de Botton writes, "It is a wonderful thing to live in a world where so many people are nice to children. It would be even better if we lived in one where we were a little nicer to the childlike sides of one another" (122). 8. I sometimes wondered, reading this book, as if the author had gotten inside my head for a while and was writing directly to me, that's how poignant it felt. 9. I found this book simultaneously hopeful and depressing. 10. Reading this book required facing and acknowledging a lot of immature, unrealistic and naive views I have regarding love in all of its forms - from romantic to parental to self-love. I would definitely recommend this book and hope anyone who reads it wants to discuss it ad nauseam. Incidentally, you all are probably full caught up on The School of Life on YouTube, but here are a few of de Botton's videos that seems particularly applicable to this whole discussion. 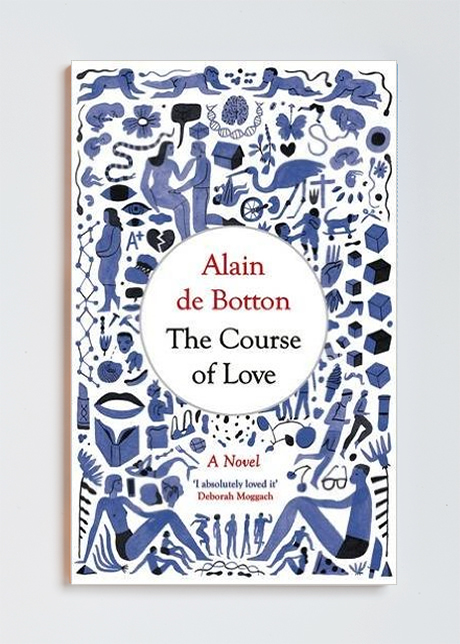 Finally, I don't think de Botton (or anyone else for that matter) has all the answers when it comes to relationships or can offer the final word on whether or not a person should get married, stay married or anything in between. People are just people, and the best I hope for is to view the world from a different perspective or see it through a window that may have before been foreign to me. The Course of Love provided, at times, both.